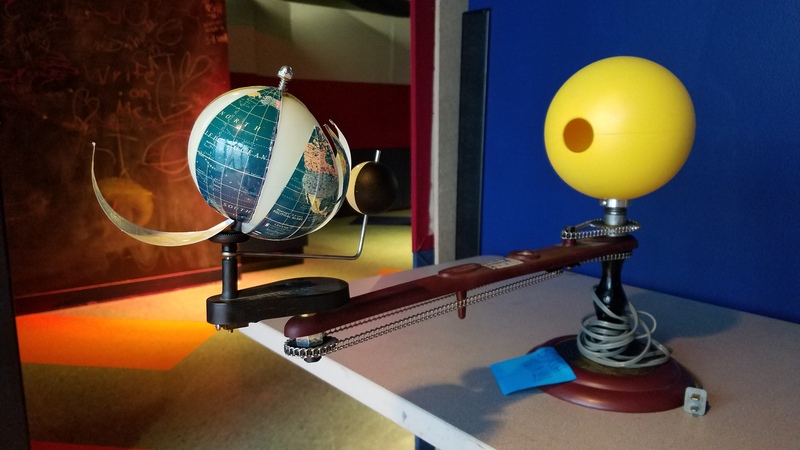 This globe is used to simulate an eclipse, but was falling apart. Now the outer layers of the globe have been repaired and the globe can be used for demonstrations leading up to the eclipse this summer. Photograph from 1938 of the city skyline from the planetarium before the dome was built. The archival work space in the observatory of the Carnegie Science Center. Climbing the ladder up into the dome of the planetarium, the last thing you would expect to find are boxes of old scripts, scrapbooks, photo albums, and films. But that is exactly what the Buhl Planetarium, now located in the Carnegie Science Center, found. The original Buhl Planetarium was constructed in 1937 and opened to the public in 1939, making it the fifth planetarium to open in the United States. When they moved to become a part of the Carnegie Science Center, many of these archives were thought to have been lost. 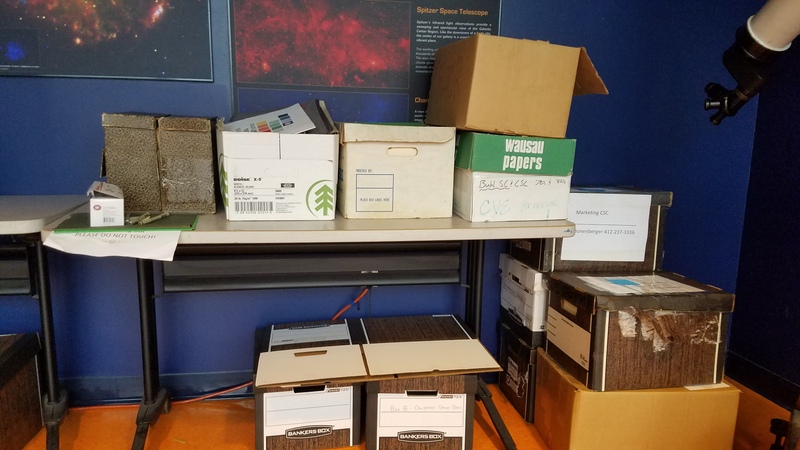 Upon the discovery of these items, the planetarium sought an archival intern to organize and catalog the items, determine the best storage for documents, and figure out which footage formats can be preserved. However the position evolved into much more than that. The original expectations were to go through about half of the documents in storage, and set up a numerical inventory where files can easily be located, a plan for curation was also formed. The current end goal is to have an interactive, digital display on the history of the Buhl Planetarium available to the public. To organize the display, I have gone back through our inventory to pick photographs and newspaper clippings and travelled to the storage facilities in Etna to collect further documentation. I also had the opportunity to work on other projects such as repairing a globe and repairing the scrapbooks that had been found. Within the collections of the planetarium, anything and everything could be found about Pittsburgh in the 30s through 60s. The scrapbooks contained newspaper clippings on everything from school trips to visiting the planetarium, to the letters written by the planetarium director, to information about how to view an eclipse, to the various travelling exhibits held at the Buhl Planetarium. The planetarium hosted a variety of fairs and exhibits including a geography fair, science fair, travelling exhibit on aerial defense, and a miniature world’s fair with exhibits from the 1964 world’s fair in New York. I worked in the observatory where we keep telescopes, old and new. 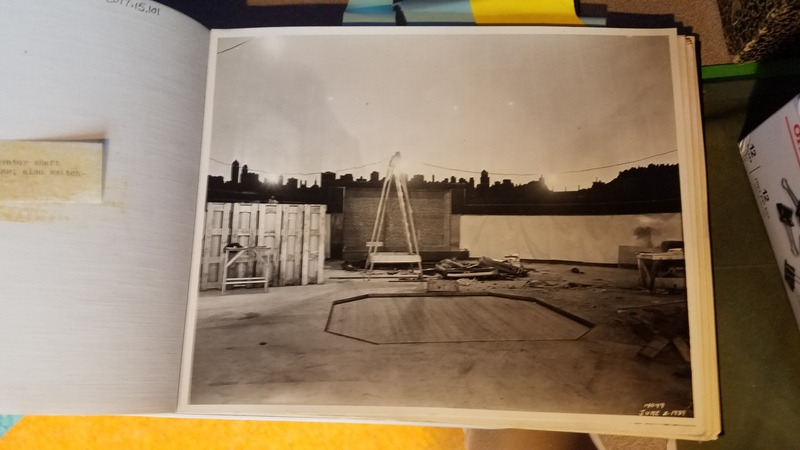 One of the photographs that I loved finding was of the lobby of the original Buhl Planetarium, and while this does not sound exciting, there is a telescope in that image. The same telescope that sat in the observatory with me. It was great to be able to find documentation on the age of this telescope that everyone at the Science Center just called ‘very old’. Working through the Carnegie Science Center has been a valuable experience. People do not immediately think ‘historical exhibit’ at a science center, so this project presented its own unique obstacles and rewards. The Science Center archives still have many steps to go, but now there is a plan in place to handle all of the historical documentation. It will be exciting to see where the Buhl Planetarium will go from here.